Many Light Sport and ultralight aircraft are equipped with integrated rocket-deployed whole airframe parachute systems. And, just like other products under the LAA ČR (Czech Civil Aviation) administration, these systems require certification for approval. For this certification, and the Type Certificate, all requirements of the certification standard must be proved and recorded for both the complete parachute-rocket system and the parachute itself. The parachute must be tested for strength, opening time and rate of descent. The manufacturer establishes the basic parameters for the use of each parachute model and determines its load capacity and maximum operational speed. More specifically, the manufacturer tests for the highest speed possible at the moment of parachute opening, and also the minimum time necessary for complete parachute unfolding and inflation. This information is used to derive the usable height above ground level for the rescue of aircraft and crew. For the aircraft engineer, the tough assignment with the parachute design comes in finding the delicate balance between opening time and dynamic load. The longer the opening time of the parachute, the lower the dynamic impact there is and thus a lighter demand on parachute strength and also on connectors and airframe fixing points. Unfortunately the converse of this is that as opening time is prolonged, the necessary height for parachute inflation is increased. The designer has to design a parachute that complies with given specifications and tolerances not only as it pertains to regulations (e.g. according to German DULV standard the time of opening must be 4.5 sec. ), while also finding an acceptable compromise between the requirements mentioned above. This problem can be tackled by way of a series of technical steps, including canopy shape, central opening size, systems with various flaps and slots, and above all size, shape, material type and slider area, which increases the canopy opening time. The slider is usually made of fabric or a mesh ringlet that has grommets on the outside perimeter through which the parachute lines run. The slider is packed close to the parachute canopy, with all lines running through its limited size. When the parachute opens the slider does not allow the canopy to open fully – it opens only to the slider's diameter. In this phase the parachute is pear-shaped and this reduces the first dynamic impact. Only after this partial opening, and due to increased pressure, does the canopy start to widen as the slider is forced downwards along the parachute lines, in a more controlled opening sequence. To tune the opening speed it is necessary to experiment with the slider's diameter and area as well as the other canopy options. The dynamic pressure created by the aircraft's speed at time of opening works to prevent the slider from making its way down the lines, as the parachute inflates. Simply put, the knowledge required in the art of tuning a parachute comes from rich experience and lengthy testing by the manufacturing company. Also important in designing rocket-deployed rescue parachute systems, besides the requirements from aircraft manufacturers and engineers, are valid regulations, or certification standards. Currently we have practical experience with three certifications standards applicable to rescue systems (further Z.S.). We present their most important items in the following paragraphs. In this regulation the rescue system is not obligatory. Maximum allowed rate of descent is 6.8m/sec at AMSL. In this standard the parachute strength is verified at maximum weight and maximum speed, which is increased by a safety coefficient of 1.05. Drop tests must be carried out for maximum recorded speed. Canopy opening time for weights 450 – 560 kg is not specified and the manufacturer records minimum opening height at a speed of 65 km/h. Opening shock must also be recorded, and drop tests must verify stability (oscillation, swinging). The Regulation ZS 2 also demands at least three firing tests from a trailer behind a vehicle. Two of these tests are intended to check canopy opening at the speed of 65 km/h and at least one test must be carried out by firing the parachute in the upright position over a towed hurdle behind vehicle at the speed of 100 km/h. The hurdle simulates a T-shaped aircraft empennage and is 2m high, 4m aft of the firing point. In this case, the test must prove sufficient canopy extension to avoid catching on the horizontal stabilizer. By regulation all UL aircraft in Germany are required to be equipped with parachute rescue systems. The parachute rescue system strength is verified at maximum weight and maximum speed. They are not multiplied by any safety coefficient. The certification requires at least three drop tests at a speed not lower than the aircraft's VNE. Opening shock must also be recorded and stated. 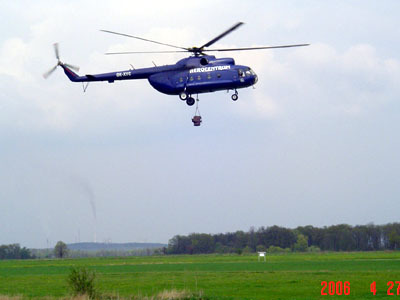 Further drop tests are used to verify stability, similar to the requirements of the Czech regulation. In the tests of the rescue parachute systems according to the German regulation the coefficient k is important. It is established as the ratio of maximum allowed aircraft speed to aircraft weight, or VNE/m, expressed in km/h/kg. Verification of the minimum canopy opening height, and thus the rescue, is achieved using this coefficient. The German regulation also requires at least three firing tests to verify system function and complete canopy opening with coefficient k lower than 0.4 (testing speed varies according to drop speeds from 45 to 65 km/h). The test to verify minimum canopy opening time is carried out by way of a drop test from a flying aircraft or helicopter at a coefficient more than 0.4 and a speed of 120 km/h. The canopy opening time at the test aircraft weight of 472.5 kg must be less than 4.5 seconds from the time of rocket engine activation. The German regulation strictly demands this figure. For rescue system canopies designed for higher speeds, the tested minimum rescue height increases from 60-80m agl to 120-160m agl, almost doubling the minimum rescue height. It can therefore be shown that a pilot's determination to fly slowly below 150m agl should not be considered safe when equipped with a rescue system designed for higher speeds. Simply put, it is not possible at present to provide a rescue system that could save a low -weight ultralight aircraft at less than 60m above ground at the critical speed of around 300 km/h. Instead, minimum rescue height is at least 120m agl in this case. The parachute rate of descent must not be higher than 7.5m/sec. 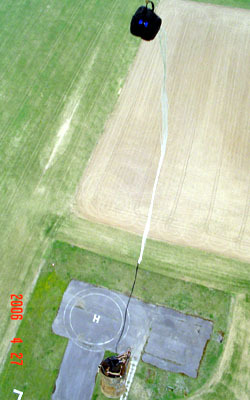 (measured 30m from the ground by means of a drop cord). Also, each aircraft anchor point for the mounting slings and cables must be able to withstand the canopy opening shock multiplied by the safety coefficient of 1.5, tested from 1000m AMSL. Since there is a required 4.5 sec opening time by the German regulation, this means that a smaller, lighter parachute will have a larger opening shock. This means that a heavier aircraft airframe is required, with particular respect to the rescue system anchor points in order to handle this opening shock x 1.5. Thus, with more aircraft anchor points and a heavier airframe, German aircraft tend to be heavier in these areas than aircraft that come from the Czech or US markets, that both require different strengths for front and rear anchor points for parachute mounting slings. As a result of the Czech and American regulations, the airframe and the whole rescue system are much lighter. The Czech Republic accepts both regulations and the German tests can be carried out in our country in the presence of the main Czech inspector. It is an important testament to the cooperation and mutual trust between the DULV and the LAA ČR. The US Light Sport Aircraft (LSA) category includes aircraft up to the max gross weight of 600 kg. Rescue parachute systems for these aircraft are not mandatory. The maximum allowed airspeed for light sport aircraft in horizontal flight is 222 km/h. The coefficient of speed increase for safety comes from the speed at 75% engine power and it corresponds to 109kts (i.e. ca. 201km/h). The safety factor is 1.21 and thus the test speed is ca. 245 km/h. By weight the safety coefficient could be 1.22 and for speed 1.23. The cumulative safety factor must just be at least 1.5 (1.22 x 1.23 = 1.5006). These figures must be balanced. The standards were set on the direction of the FAA for this category. The opening shock (in pounds or in kN) must also be determined. To verify the rate of descent and opening time, the parachute must be tested at operational weight (for instance at 472.5 kg) and speed (90km/h). 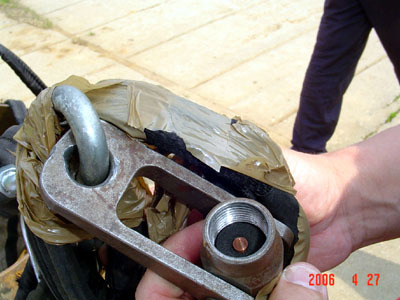 To verify the strength, the canopy must be dropped three times. This would be done at maximum operational weight (the rescue system loading capacity), which in this case would be 473 kg, which with a safety factor of 1.25 gives you a weight of 591 kg and a drop speed of 245 km/h. The US standard does not specify canopy descent rate and minimum opening time. But the descent is recorded from a height of 5000 ft / 1500m AMSL. In USA it is left up to the companies and the invisible hand of the market - producers do not have to publish their figures. It is important, however, to have the correct placarding of all dangerous functional parts of the system. For instance, a warning placard is required near the egress point of the rocket motor (similar to what is required by the LAA ČR). Relevant placards are required in the cabin as well. Also, the so-called Emergency Contact information is required on the manufacturer's websites with information on what to do in the case of an accident to prevent any injuries that could be caused by incorrect handling of the rescue system after an accident. The Emergency Contact information must also give instruction to first -responders such as firemen and rescue workers. This aspect of safety is handled very well in the USA. As for aircraft in the Experimental category in the USA, there is no requirement for any kind specification of the rescue system or the installation – this is left up to the individual aircraft builder and not any regulation. These aircraft cannot be used for commercial purposes. Rescue Systems for Cirrus, and other certified, standard category aircraft. Aircraft produced by the Cirrus Design company are the first General Aviation aircraft in the world to be equipped with ballistic rescue parachute systems as standard. Maximum take-off weight of the newly designed Cirrus aircraft due for the year 2007 is set at 1724 kg. Rescue systems configured as one, two or three parachutes in one unit are being considered. The company announced a classic tender to deliver a rescue system within the required parameters, which requires overcoming the current technical limitations on modern systems. Czech companies, as well as Galaxy, were involved in this tender. The current Cirrus models SR22-G2 and SR20-G2, with weights up to 1500kg, are using one canopy with a resultant canopy opening time of 6.5 to 6.8 sec., which satisfies the desired requirement to rescue the aircraft occupants while in the airport traffic pattern, where roughly 80% of all accidents happen. Mostly these are due to pilot error caused by high stress and high traffic levels. The new Cirrus model must have a rescue system with at least the same efficiency as the current one. The deployment time must be at most 6.5 sec. (respectively 5.0 sec. for just the canopy) at a speed of 90km/h. The test requirements for this system are similar to the LSA requirements. The new Cirrus aircraft is a fast five-seat machine. To design and manufacture a parachute device for this aircraft and to the prescribed requirements is an extreme challenge. In order to increase the safety coefficient the manoeuvring speed of 296 km/h was used When multiplied by the coefficient of 1.2 it corresponds to a test speed of 356 km/h and a weight of 2068 kg (1724 kg x 1.2). This complies with an exemption allowing a reduced safety coefficient of 1.44, down from 1.5. This exemption was awarded by the FAA to the Cirrus Company after a lengthy negotiation, because the original requirement of a 1.5 safety factor was limited by the manoeuvring speed. The 1.44 factor is still a tough technical proposition to tackle, and it will be very hard for the newly designed system as well. Moreover, the parachute also has requirements for a very short opening time and a limited total weight of the rescue system. For the present Cirrus aircraft, no system has achieved the desired safety coefficient of 1.5. The new assignment allows a maximum total rescue system weight of 27 kg. Cirrus have set a hard act to follow in their efforts to improve safety of aircraft crews in flight. As proof that rescue systems in aircraft do in fact save lives, Cirrus has already recorded ten aircraft saves where occupants were rescued after activating the parachutes (in one case even with a technical malfunction of the controls). The seats have special materials built in to specially to reduce the impact in the case of a hard landing. The rocket is physically separated from the occupants, because of the toxic chemicals used in the rocket motors of the US rockets. Hydrogen Chloride is produced during the rocket burn of US rockets, which is not a problem with the Czech systems since a smokeless powder is used. Galaxy have a more advanced fuel from the Synthesia company, now the Explosie a.s., due to their great developments and staff (simply, tradition and our handy golden hands). 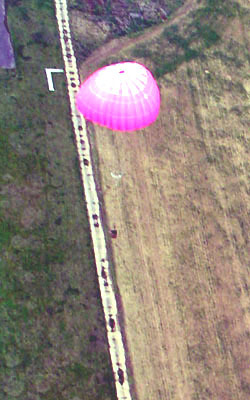 On 27th April 2006 the company Galaxy carried out fresh parachute tests at the Hořín airport near Mělník under the supervision of the LAA ČR. Tests were done by dropping parachutes from a MI-8 helicopter. The helicopter crew was made up of captain Ing. J. Černý, second pilot Ing. J. Rajda and onboard operator S. Fuxa, who looked was responsible for the parachute drop. 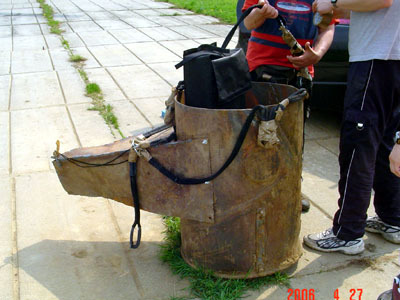 The required weight was made up of steel container, filled with additional steel plates. 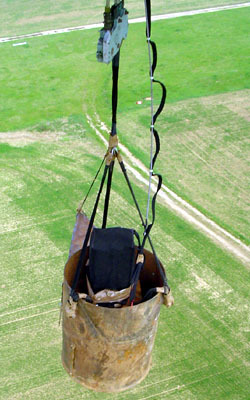 A force measuring device was placed between the weight and the parachute sling, to measure dynamic opening shock of the parachute. This device is based on the principle of a copper cone deformer found in a dynamometer. The strength and force reacts on the cone, changing the shape and thickness, from which we can read the strength at opening. The parachute opening activation is initiated by the connecting sling length (4m), which electrically opens the release mechanism of the parachute. The crew flies at a set height of 200 – 300 meters according to requirements of the respective drops, and according to prearranged speed requirements, for instance at 90km/h, 120km/h or 250km/h. The pilot maintains a set speed and height above ground. For higher accuracy the second pilot calls out speeds and heights and directs the helicopter to the drop zone where the onboard operator releases the parachute and weight. To keep all the parameters in check the crew must coordinate their efforts precisely. The drop is recorded on camera from the ground. 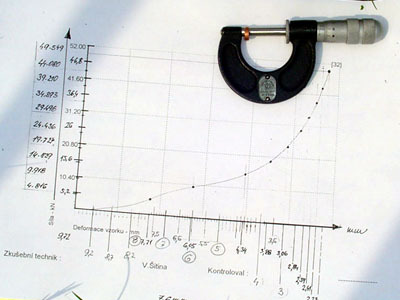 From the recording is then possible to measure times of canopy opening and rescue height. Altogether six drops were carried out at these tests. The parachute canopy is housed in a container, and is drawn out when activated. Then, after the parachute lines, 5.5m connecting sling and fixing slings have been stretched out, it unrolls. At this phase the system is about 18m above the aircraft as a package before it starts to inflate. The advantage of this system is that the canopy unrolls only when it is sufficiently far from the aircraft. This considerably reduces the possibility of the parachute becoming entangled in the aircraft or flying debris at high speeds. This principle has been patented by the Galaxy company since 1994 under patent number 1859-94. 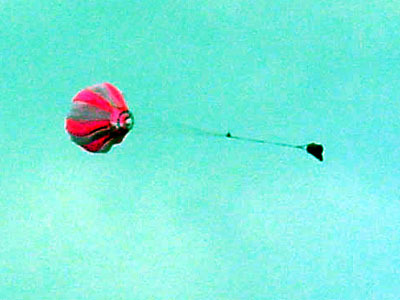 This DULV test verified minimum parachute opening time using a test weight of 472.5 kg and a deployment speed of 120km/h. The drop height was 250m above ground level and the opening time recorded was 4.45 seconds from time of release from the hook of an MI-8 helicopter. The maximum opening time of 4.5 sec. was set by the regulation. In reality this time is considered to be the total time of opening, including the time required to position the canopy above the aircraft after inflation. The recorded time from the drop time to the release of the container has been shown to be equal to the realistic deployment scenario time from rocket firing to parachute deployment and inflation above the aircraft. In designing a parachute, it is important to utilise as much of the canopy opening time allowed by regulation as possible, as this allows the system to be deployed at higher speeds. The tested canopy was designed for speeds up to 320 km/h. After completion of this test all results were immediately analysed, including measuring of the dynamic opening shock. This is done by measuring the deformation of a copper cone dynamometer used for measuring dynamic shock. It showed a width of 3.6 mm. According to the test table, this corresponds to a dynamic shock of 20.8 kN. The test proved that the canopy complies with the required opening time and maximum dynamic shock. This time the parachute was tested for an operational weight of 472.5 kg for the Ultralight Category. Our first step was to verify whether the canopy intended for the DULV test, and with the designated opening time of 4.5 sec., would pass one of the tests required by the US-LSA standards. The test weight was increased to 580 kg, an increase of 22.7% over the previous test weight. The tested speed was 250km/h, an increase of 23%. Therefore, the total safety coefficient met the required 1.5. The opening shock was measured at 34 kN, with an opening time of 3.75 sec., including the initial drop time. Without the 1.25 sec drop time, the net time of full canopy inflation was only 2.5 sec. The canopy made it through the test without any damage. The cone deformation was 2.59mm. Ing. Milan Bábovka adds: It is not recommended to pursue these experiments further, because all canopies have their absolute strength limits, and with ever-growing kinetic energy loads there are very high "g" loads on opening. These would result in additional reinforcement of airframes to sustain these loads, and along with this large weight increases. From our long-time testing and measurements of parachute drops we have learned that it is not possible to test a canopy only at a speed of 300 – 320 km/h just by dropping it at required operating weight and then using these figures for LSA aircraft. We have found that it is necessary to include a speed correction factor for the drop itself. Therefore, for a required opening speed of 321 km/h, the drop aircraft must in reality have a calibrated airspeed of 350 km/h at time of drop. The reason for this required correction is due to the weight resistance before the canopy is inflated, and due to airspeed indicator error. Of course there are also computer programs and tables that can be used to make these corrections. It is essential to state these figures correctly so that the final design of the rescue system has the same performance parameters as stated when installed on an aircraft with corresponding weight/speed. This 22 – 25% increase in weight verifies canopy strength at time of opening. It is not necessary to use the maximum test speed. Such a test is essential for all the weights in the scope of the LSA Category in the USA. Thus, testing canopy opening time at minimum speed to 4.5 sec., as required in Germany, is not practical or real. Canopy opening time is inevitably prolonged and with this comes a growing height necessary for full opening and canopy inflation. However, in General Aviation the safety factor of 1.5 is set by regulation and must be kept. There are some minor exemptions like the one granted to Cirrus. For this reason most rescue system manufacturers are not able to find a satisfactory solution to this problem, that would allow an aircraft to be saved when making the turn from base to final, at 150m above ground level. This would require a total opening time in the range of 6 – 6,3 sec. So, there is a mere 5.0 sec. remaining for canopy opening. At the airport near Mělník the new GRS 6/600 SD LSA canopy (aimed for the American category LSA up to 600 kg) was tested at operational MTOW with a 25% increase. was recorded at 5.8 sec. including the drop time of 1.25 sec. The measured opening shock was 22.5 kN (this figure is not necessary for an aircraft designer or aircraft user). Calculated rescue height with fully opened canopy was 130 – 140m above ground level. 2) The tested opening time at the maximum speed of 250km/h and at the weight of 750 kg was 5.0 sec. including the drop time. Measured opening shock was 32.5 kN (this figure is used as proof of canopy strength). The canopy inflates better when braking from a higher speed with the regulating slip speed of the slider. And, if the canopy is designed correctly, the opening shock remains the same. Ing. Milan Bábovka adds the following: With these parachute drop tests in May, 2006, the Galaxy High Technology s.r.o. company has completed a two-year development cycle of rescue systems for General Aviation aircraft and aircraft that fall into the LSA category (the USA standard). A total of 130 rockets were fired from a vehicle mount to compare canopy opening times. A total of 65 parachutes were dropped from the L-410 Turbolet aircraft and from the MI-8 helicopter. Along with this, the company filed an application to patent the new series 6 canopy design for the weights of 360 kg, 473 kg, 600 kg, and 650 kg, all with a verified safety coefficient of 1.5. The designation of the new ZS are: GRS 6/360, 6/473, 6/600, 6/650 SD LSA, year 2006. In conclusion, it is necessary to state that the GRS 6/600 SD LSA weight, including a 6m long parachute sling and the rocket engine is only 12.3 kg. The descent rate is only 6.9 m/sec. At present this is probably the best rescue system in its category on the world market. Commentary written by Ing. Milan Bábovka of the Galaxy company.